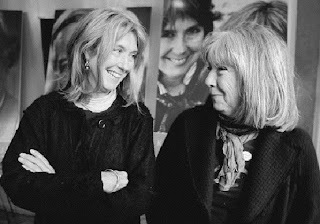 Kate McGarrigle (left) and her sister Anna chatted at the Monument National in September 2004 after a news conference announcing that the folk music duo were recipients of the Governor-General's Performing Arts Awards. Kate McGarrigle died Monday of cancer at age 63. Kate McGarrigle, one half of the McGarrigle Sisters, mother to singers Rufus and Martha Wainwright and supremely talented singer and songwriter from Canada, died on January 18 at the age of 63. Listen to the story on NPR. I loved her voice as soon as I heard it as a teen-ager in the mid-70's. So many of my favorite songs were written and performed by Kate and her sister Anna. Having lived in France and as a child, I loved the old French songs, too. It is amazing the love an artist can put into her songs. I think that love shielded Kate in her own world of music and passion for life. It was not about fame or fortune. She went unnoticed by the masses of people who buy records but some of us were lucky enough to discover and treasure her music. I know I will play those songs for my grandchildren. This news saddened me greatly. Everything I've ever heard from her has moved me deeply. I have you to thank for even knowing she existed. I'm sorry for your loss, as I know it's profound. Farewell, Kate. You meant an awful lot to me. Your music with Anna will live forever. A special thanks to you, CR, for calling me to make sure I knew that KM had passed away. You are one of the few people in the world who truly know what's important to me. Oh, that's very sad. I never did get to see them play but I loved their music too. They were not only excellent musicians but they harmonized with one another perfectly.